Candy floss is the perfect food for ice cream parlours, fun fairs, entertainment centres, shopping malls. And everybody likes to eat it - from kids to adults. Make Different Coloured Candy Floss. 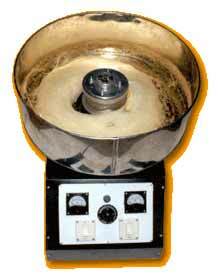 Easy Operation, Heater & Rotary action of bowl, makes fast, Soft Candy Floss. People of all ages love eating Candy Floss. Easy to make & only ingredient required is Sugar.